Anthropologists are following in media’s and politicians footsteps: They care less about the floods i Pakistan than for the Tsunami in Southeast Asia, the Katrina floods in the USA and the earthquake in Haiti. A quick search reveals nearly complete silence. While several anthropologists mention the desaster or call for help, they don’t contribute with any analyses. The only piece by an anthropologist that deals specifically with the floods consists of rather dubious culturalisations: Cultural wisdom in crisis by Kashmali Khan from Oxford University, published in the Pakistani Tribune. But while I am writing these lines, suddenly an interview about the flood pops up at the great blog Anthropologyworks. Pakistan expert Maggie Ronkin (who’s recently taught on Justice and Peace in Pakistan and Social Development in South Asia at Georgetown University) interviews Fayyaz Baqir, Director of the Akhter Hameed Khan Resource Center in Islamabad. This capacity and the will to help is echoed in several stories in Pakistani media. The Pakistani youth has risen and literally stepped out on the streets to help their countrymen affected by the flood. (…) Each day brings a relentless and constant chain of support. Where the monetary contributors stop, there is a group of people ready to take over by running to crowded bazaars everyday to buy food supplies, clean drinking water and medicines. From there yet another massive portion of the population is stepping in to pack those supplies and load them into trucks to deliver them to the affected areas. As Pakistani authorities failed to provide the necessary leadership needed and with no proper coordination in the relief efforts, the civilian population of Pakistan has taken it upon themselves to do what they can in the face of this crisis; in the process, developing a conscientious society that we’re all proud to belong to. Small, scattered groups of young boys and men had formed where the rain was the harshest and was threatening to sweep away cars along with their occupants. (…) They worked in unison, all of them had a single purpose and that was to rescue other human beings. (…) They waved at us, hurriedly preparing to help the next hapless driver who was blindly careening into their path. We waved back with euphoric ‘thank you’ but they had already become busy in helping others. I was touched beyond words. These young men were poor labourers who were most probably hungry as a day full of rain would not have given them a chance to earn their daily wage. I am sure that none of them were owners of a vehicle either. But their dedication to help the other members of society who definitely had more material possessions than they had, without any contempt at all, told me something. It told me that deep inside they were people of substance. Those individuals who had their moral compasses pointing in the right direction. It also told me something else; that in fact, these were our heroes. Also, these people who slog from sun-up till sun-down for a meagre amount that could hardly put a decent meal on anyone’s table, are our actual role models. Save Pakistan from the catastrophe is the title of an earlier article where anthropologist Fazal Amin Baig calls for action. Fazal Amin Baig wrote it earlier this year in the aftermath of a heavy landslide that took the lives of 19 people and displaced more than 1,500 people. “The year 2010 witnessed a natural disaster, which did not indicate a good omen to the people of Pakistan.” Unfortunately, the anthropologist was right. Check also Dawn’s excellent special section about the flood and the updates at Global Voices and al-Jazeera and don’t forget to help. For an excellent example of how to contribute as social scientists, see my earlier post on anthropologists on Katrina. Haiti Earthquake: Worldwide solidarity, a common humanity? Good evening. I stand here both inspired and challenged by the work of Dr. Akhter Hameed Khan, who, by profession, was a locksmith, teacher, and, ultimately, iconic development practitioner. In the 1940s, as a bright young civil servant in the British Empire, Dr. Khan decided to quit his job and devote the rest of his life to serving the poor. In Bangladesh, formerly East Pakistan, he still is remembered fondly for projects in the 1960s to train civil servants to lift people out of rural poverty. Later, he provided intellectual leadership to the Aga Khan Rural Support Program in Pakistan’s Northern Areas, and to the Orangi Pilot Project in Karachi’s largest squatter settlement. In Islamabad, I work with Fayyaz Baqir, who directs the Akhter Hameed Khan Resource Center. The Center builds knowledge on and advocates for people-centered participatory development, thus promoting Dr. Khan’s legacy. Last summer, Fayyaz and I launched Justice and Peace in Pakistan, an undergraduate course videoconferenced in real-time between Islamabad and Georgetown. We initiated meaningful dialogs between students and Pakistani development practitioners, who shared valuable knowledge on social mobilization and capacity building of various kinds. These interactions strengthened bonds between people who truly care about concrete, constructive change in the lives of ordinary Pakistanis. It seems altogether appropriate, then, to present Fayyaz’s own words about the unprecedented, calamitous flooding in Pakistan, and about Pakistanis’ dire need for our response this evening. First, let me mention some details that every speaker may repeat because their implications are utterly tragic and overwhelming. This summer’s cataclysmic flooding affected all regions—from Gilgit-Baltistan in the north to the provinces of Khyber Pakhtunkhwa, Punjab, Sindh, and Balochistan. 20 million people were displaced, and more than 8 million remain with food shortages. In some areas, water rose to 18 feet, and desperate residents stood waiting on rooftops for non-existent aid to arrive. The entire town of Jampur in the Saraiki region drowned this way. Not a single home is left. Women and children were most severely affected due to dietary deficiencies, and to lack of health and latrine facilities, clean drinking water, and security. At many sites where food and emergency supplies were distributed by well-meaning but inexperienced charity workers, mobs attacked aid trucks. Women, children, and the elderly were unserved and left behind. Just over 100,000 tents were available for 2 million people. The shelterless squatted by roadsides under the blazing summer sun during Ramazan. This has continued for months now. Floodwaters destroyed the health care infrastructure in the worst-affected areas, leaving inhabitants vulnerable to water-borne diseases. There also was an absence of law and order, mainly in Sindh. Looters using boats ransacked abandoned homes. In Punjab and Sindh, 1,400,000 acres of cropland were destroyed. Crops affected were cotton, sugarcane, rice, pulses, and animal fodder. 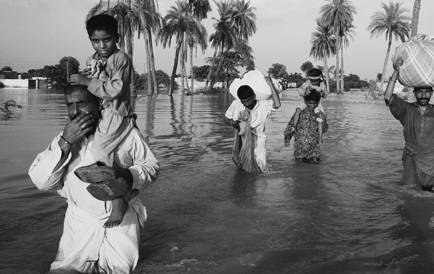 Floodwater and rain destroyed 700,000 acres of cotton, 200,000 acres each of rice and sugar cane, 500,000 tons of wheat and 300,000 acres of animal fodder. The loss of 2 million bales of cotton led to an increase in futures of the commodity on the international market. I come from the Saraiki region, which is the birthplace of Indus Valley civilization. Multan, the region’s cultural center, is called the city of saints. Legend tells us that it was the only city in the world saved from the wrath of Genghis Khan’s armies—because Sheikh Bahauddin Zakariya, the great Sufi saint, convinced invaders to spare the people. The people are reputed for soft manners, hospitality, humility, tolerance, and devotion to mystical Sufi music, poetry, and literature. Khanqahs (hospices) welcome visitors of all faiths and beliefs, and they offer sanctuary to the downtrodden, misfits, and outcasts. Besides boasting rich cultural and spiritual history, the region has a strong agricultural economy. It is Pakistan’s cotton belt. It also is where other rivers join the mighty Indus, and people live on both sides of the Indus. That is one reason why they are affected so catastrophically by the floods. Another is that, due to very unequal income distribution, the region is oppressively poor. Rajanpur district lacks critical economic and social infrastructure and has the highest poverty rate in the nation. Struck in his village near Kot Mithan, an agricultural laborer, Sohna, relates the tragic loss that he experienced. ‘I was half asleep when I heard voices outside. As I went to discover what was going on, I saw everyone running to save lives. I took my family to higher ground. Thank God my family is saved but we are left with nothing. There is no shelter and no food for us. We ran away with only the clothes we had on. I have not changed for 3 weeks. The water level rose to 10 feet and our homes were completely destroyed. We lost all our belongings, including clothes, utensils, everything. In some parts, water levels rose 12 feet’. Another laborer lost his home, fields, and cattle, but rescued utensils. ‘My wife hardly had time to save anything because the water was rising so fast. I lost everything but I thank God that my family is alive,’ he said. A roadside offers the only dry land in sight. A woman, Rahat, adds: ‘Water started at night, and, by morning, we were wading hip-deep, trying to save our livestock and belongings. Within a short time, the whole house collapsed and our future dissolved into mud before our eyes. The floods devoured our home and livestock. Now we have nothing, there is nothing left for us’. According to UN sources, people are cramped in scattered spontaneous settlements, making it very difficult to address life-threatening risks and to provide health care. Unsafe water, inadequate sanitation, food shortages, and a lack of access to health services all pose serious risks. The likelihood of disease outbreaks and deaths due to malnutrition is of grave concern. As noted, many of those worst affected by flooding come from areas where the disease burden, malnutrition rates, and health risks already were very high. Illness, food insecurity, and crop destruction compound a dire situation, making people more vulnerable, especially women, children, and the elderly. In the current phase of relief, attention must focus on drinking water, sanitation, and nutrition; on integrated, effective, and timely responses to diarrhea, acute respiratory infections, malaria, measles, cholera, and malnutrition; and on maternal and neonatal mortality and morbidity. Food is needed for approximately 8.2 million and water and sanitation facilities for 7 million people. On the horizon, hundreds of thousands of women are expected to deliver babies under these conditions. There are very few doctors, paramedics, and medical supplies. Water-borne and viral diseases already have caused local epidemics. Welcome assistance is arriving from many sources, but it is woefully insufficient given the unprecedented enormity of the disaster. Right now, ordinary Pakistanis still desperately need relief—food, medicine, drinking water, and shelter. Where water levels are receding, they also have started to return home. Rehabilitation tasks on return will be pumping water out of fields, and procuring seeds, livestock, and productive farm implements. Securing cash loans to purchase equipment and rebuild homes will be another large challenge. Reconstructing roads, bridges, and other infrastructure lost to flooding will take a very long time and enormous resources to complete. Thankfully, donors are responding to people’s needs. Akhuwat is a highly regarded interest-free micro-finance charity with which Justice and Peace in Pakistan partners. Akhuwat’s capacity building approach mobilizes low-income borrowers to be self-reliant and assist others. In 22 cities, typical borrowers start businesses with $200-250 Akhuwat enterprise loans. Akhuwat now has adopted Rajanpur, and, on the basis of social collateral, will deploy 90% of its flood resources to rehabilitate 10,000 families there, beginning this month.